La-La Land Records, Warner Bros. Pictures, TIG Productions and Warner Bros. Music mark La-La Land's 250th soundtrack release and Warner Bros. 90th anniversary with this special, 3-CD expanded archival collection release of James Newton Howard's masterful original score to the 1994 Warner Bros. epic western Wyatt Earp, starring Kevin Costner, Dennis Quaid, and Gene Hackman, and directed by Lawrence Kasdan. Considered by many to be the finest piece of western film scoring in decades, this notable work by Mr. Howard is finally given the deluxe treatment it has always warranted. Discs 1&2 feature the expanded film score, while Disc 3 contains bonus and source cues, as well as original 1994 soundtrack album edits. 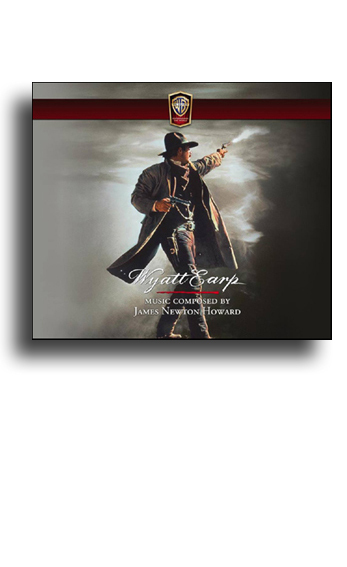 Supervised by the composer and producer/actor Kevin Costner, this over-162 minute presentation was produced by Dan Goldwasser, mastered by James Nelson and is limited to 3000 units. Tim Greiving's exclusive, in-depth liner notes round out this must-have soundtrack release.